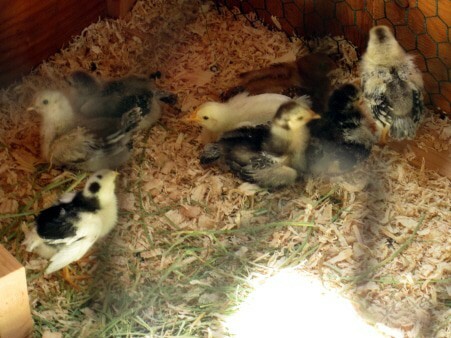 My too-large herd of baby chicks actually taught me something I could use for my paper mache projects. OK, they didn’t “teach” me, exactly, but I did learn it because of them. You might recall that I previously mentioned, in the post about my paper mache baby chick, that I received more birds from the hatchery than I ordered. That has caused some frustration and a few dilemmas here at my house in the last two weeks. So far, my efforts to find local homes for the extra birds have not been successful, so all ten birds were quickly outgrowing a brooder made for three. I went to the local farm store to buy some chicken wire. I needed a roll four feet wide, and all they had available in that size was vinyl coated, so that’s what I bought. I worked with the wire almost all day yesterday, trying very hard to get the project finished so the chicks could be moved into their bigger quarters and, incidentally, out of my kitchen. When the project was all done I noticed something unexpected — I wasn’t bleeding. I know lots of people like to use chicken wire to make armatures for their paper mache sculptures, but I’ve never liked using it because I inevitably end up poked full of holes. I’ve just come to expect that any project involving chicken wire will also involve a box of Band-AidsÂ®. I have no idea why the vinyl-coated wire didn’t lacerate my arms and hands the way the naked wire does. There are just as many cut ends and sharp little wires as there would be with regular wire — but no blood. So — now that I know that the vinyl-coated wire is less aggressive, I can actually think about using it for a sculpture. That would mean taking another trip to the farm store, of course, but I seem to be visiting them a lot lately. I’m thinking that a saddle-billed stork would be nice in the new garden – they’re 5-feet tall, so it will be a challenge to balance it. Maybe the legs could simply be made longer and without PM on the lower section, and then they could be pushed into the ground. The body, neck, head and beak could be made with the chicken wire and covered with masking tape, then paper mache clay. Then the piece would be waterproofed with marine (spar) varnish, to protect it from the elements. — The paper mache clay tortoise is still doing well outside, by the way. The experiment in waterproofing paper mache with marine varnish seems to be working. I don’t move him when I turn on the sprinkler, and he stays outside when it rains. So far, there’s no sign of mold. For a paper mache tree that would be the size of an indoor Christmas tree. Would I need chicken wire as an armature or would cardboard suffice? Thank you for all your help and inspiration! Hi Sydney. Will you be making a Christmas tree shape, like a cone, and adding details? Or will it have branches like a deciduous tree, with leaves? The chicken wire would work well for a simple shape, but I like the cardboard and crumpled paper or foam for anything that’s more complicated. 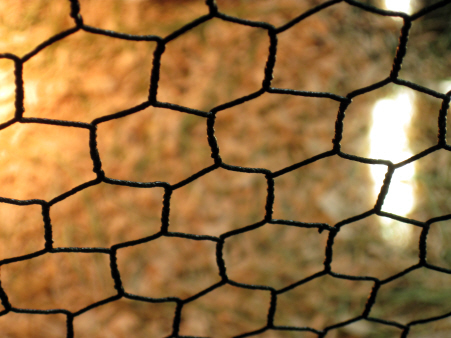 Lots of people swear by chicken wire, though. Hello thank you for your reply! It will be a deciduous tree but bare like a tree during winter in the park. This was my student can add different decorations for different seasons or occasions. I started with a cylinder piece of cardboard about a foot tall. I was planning on building up from there but I don’t know if that’s the right approach. Should I have made a stencil and stuffed like the elephant you created? Hi Sydney. There are lots of ways to get the same result, and the cardboard and crumpled paper armature is one of them. But you can also use your cylinder as a base for sculpted chicken wire. It isn’t easy to get paper mache to stick to wire, but you can just cover it with wide masking tape. The wire armature might give you more spontaneous shapes for your limbs, and it will probably be lighter than cardboard and paper. You will need to reinforce the limbs, because the weight of paper mache will make them droop. Use rebar or very heavy wire. To keep the tree from falling over, you can extend the limb wire all the way to the base of the trunk, plus a foot of extra wire that extends over a plywood platform. Another option to keep it stable would be to somehow wire the tree to the ceiling. Good luck with it – and have fun! Dear jonni, hello again- please advise…my giant head is complete & decorated, however, what can I do to balance the head to be worn, it wobbles forwards or back, I’ve got chicken wire and foam but am cluesless what shape or structure to try to attempt- any thgts? Ooh – that is a good question for one of our readers who makes theater masks. Try putting a reply comment under Douglas’ latest comment (here.) Describe your head, too, since he might not have seen your previous posts. Douglas, or one of the other regular readers on that page, might be able to help. Did you shape the bottom of the head so that it fits over the shoulders? Did you post a photo already? (Forgive me if you did and I forgot – my brain is like a sieve some days…) If you could upload a photo when you reply to Douglas’ comment, that might really help. I want to build a big half egg shell to use as a photo prop for babies. Do you have any suggestions on the best way to do this so it’s stong enough? Hi Jennifer. I haven’t made one, but we did get a guest post several years back with some great ideas. You can see it here. I think I used to be known as the old lady with the cats. Now I only have two! I think I’ll always have a cat. You must live in a rural area of Portland. I do too. Sorry, I thought I read somewhere on your site that you were in Portland. And, you are welcome. I just had to tell everyone that will listen about this site! I’ve got my sister hooked on the PMC now, too. this site does rock. i was at a loss on how to start more complex paper mache projects untill i found this site. up till the begining of this year i was just using balloon molds for my projects. so when i decided to make a head for a halloween decoration, you can imagine how it turned out. all verry round. when i get around to it and find my jump drive, ive been wanting to post a pic. of it. anyway have fun and keep up the paper macheing! btw Maggie, what’s the adress to your site? i’m not sure what a sidebar is so i dont know where to look on this site, but id like to check yours out! Maggie’s website is at http://offmyrocker-maggie.blogspot.com/. (She has a brand new grandbaby – congratulations, Maggie!) Leah, be sure to check out the other great artist’s sites over on the right-hand column of this blog, too. Thank you, Jonni. Correction… a brand new great-grandbaby! 🙂 My first great. Leah, I’d love to have you come over and visit at my site. :] That’s so true (the bucket and the water thing). & don’t worry, I don’t mind at all, besides Jonny’s right we can all share <3. I think I'm going to try it out though. I've started hoarding supplies in my room already. My mom thinks I'm crazy. I'm looking more closely at the Kitty now to see what I can do with it. I'm trying to invision what it can be :3 & if it fails, I'll at least have started/learned something and maybe it'll be easier to start a real paper mache project. It was kind of hard to come by i guess because it’s an old toy. It doesn’t work anymore and its basically just a plastic fake cat now i guess with wires inside of it. I was wondering what your thoughts would be if I used that toy as the base armature for a paper mache sculpture of a house cat or a lion or something like that? Golly, I don’t know what site you saw but I sure do know the thinking about something so much and not moving on it. I have a very heart felt gourd I’m trying to get to right now but life just won’t get out of my way. LOL The cat is adorable. I don’t remember it but I was a REAL country kid and had few toys. Lizards, hornedtoads and if I caught an owl if was in hog heaven. LOL With all the different shapes on this one it would be a little hard to do but not impossible. I would hate to see the original ruiened but it you did it that way it would take some special finishing work with small tools to make the shapes. Definately would be a challange. I haven’t used the paper clay yet so not sure how hard it would be to carve on. If not to hard it will just take a lot of detail carving. I’m afraid I’m not much help here but the toy is worth a try to copy. Cute as can be. Daaa Sorry Melisa, I’m still not used to the site and how it works. LOL I answered your question when I’m sure you meant it for Jonni. I’m sure she could give you a better answer and I AGREE. She has a wonderful site. Joyce, the whole point of this community is to get as many ideas spread around as possible. I can’t tell you how much I’ve learned from my readers. So please, answer away – that’s why this blog is here. When we share ideas, everyone benefits. Solution: Wear working leather gloves from construction/hardware stores. I’ve actually been poked with worse *Also has cats who hate taking baths*. You know those clay tools that end in a long metal tip? I’ve managed to prick my finger and bleed a lot with one of those once. I am very interested in vinyl-coated chicken wire. Does it come rolled up like chicken wire? If so, is it easier to roll out flat? Because chicken wire that’s been in a roll always wants to curve back no matter how much I try to make to stay flat while I’m working with it. Yes, I’ve used huge hardcover books and other heavy items, but they won’t flatten out formally rolled up chicken wire. Yes, the vinyl-coated chicken wire also tries to curl back up into a roll, but it does seem to behave a little better than the regular kind. I bend it backwards against the roll to straighten it out a bit. There’s probably a jig or hand-made tool of some kind that would help with the process of flattening it out. Or maybe we should invent one! Try this page to see the catalog with pictures. You can order the catalog free and it has tons of colored pictures. I spent hours looking through it to find the chickens I wanted. I had some Polish chickens, many years ago. They were beautiful birds, and a real hoot to watch. Good advice on the catalog – maybe the pictures would tell me what breeds I have in my unexpectedly large flock. How are those babies coming along?? The book will show you what they will look like as adults but don’t show what each baby is till it starts getting it’s colors. I was broken hearted one time when I sold one of the babies later to find out it was a beautiful breed. The surprises were always fun though. I hate spring to come and me not be able to order more babies. I have the room and place for them but not the pocket book for feed or time to do all the keeping clean and happy for all of them. People used to visit my place to see them and the flowers I have all over. Just couldn’t keep up with it all after loosing my DH. Sad even to this day not to have all my feathered friends. Picture one of my Royal Palm Turkey’s. HUmmm Wonder if we could make him from the paper clay. The chicks are all happy and healthy. I moved them to a large area screened off in the garage, so they can flap their wings and run around like normal birds. I only kept the Brahmas, and they’re all getting white feathers on their chests so they must all be Light Brahmas, although I originally thought the “extras” were going to be the dark variety. All the mystery chicks have gone to live in Sparkey, a tiny mountain town near here. The turkey is beautiful. He would definitely work as a paper mache clay sculpture. Check out the feathers on a hen I made a while back – I don’t like the way I painted her, but those feathers really turned out nice, and that would be a way to make that beautiful turkey tail. I have to ask you guys… are your chickens smart and/or friendly or are mine just mental? my chickens follow us around the yard and are not afraid of people. if our door is left open they also enjoy coming into our house. and then if our door is closed, they “knock” or peck on it until we come throw them scraps and whatnot. we really do live in a rural community, and we have a large yard so our chickens pretty much have free reighn. They are the best! I hope you enjoy your chickens jonni! Well, I think my chickens are smart. I think the neighbors giggle when they see me leading a parade around the yard. I think the “dumb chicken” myth started because the babies are raised without a mother to teach them things. When a human has to teach a baby chick how to eat or drink, they assume the chick is stupid. If you tell a human mother their toddler is stupid because he can’t read, you’d better duck. I think it’s amazing that my flock is able to function so well in spite of not having anyone show them how to be proper chickens. I had a young rooster that used to come running every time I came outside, and he’d follow me all over the place. He’d come looking for me at the sliding door in the back if he got tired of waiting and would “knock” on the door with his beak if he couldn’t spy me inside. OH M G. You have to be a distant family member. I near fell off my chair with this post of yours about the chickens. I SO know the bandade fun due to chicken wires. My story would need a book so can’t put it all here but I was building a chicken farm to be assable to the handicap. Spent 8 years building a buying new chickens till I had over 32 breeds if chickens. Like I said. It’s a long story but due to my own handicap due to an accident at work I had to loose all the work and chickens. I DO remember it all though and remember the bloody arms, legs and anywhere a wire could snap. Thanks for making me remember and for the laughs. Your post was a delight to me. That’s a story I’d love to hear. If you ever publish your book, please let us know.